For a classic and sophisticated look, this faux boxwood wreath is the perfect burst of modern greenery for your front door or decor. 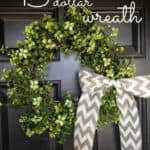 I’ve got another wreath DIY for you, shocker! 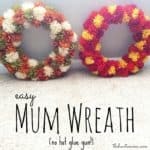 I love wreaths, and I refuse to pay big bucks for one, when I know how easy they are to make! 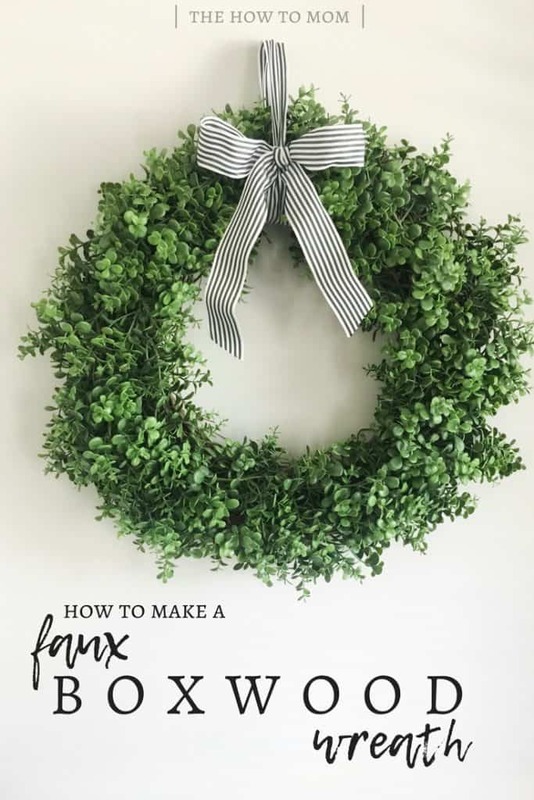 This faux boxwood wreath is no exception, it comes together in less than 30 mins and can be done for $20 or less, depending on where you find your faux boxwood. 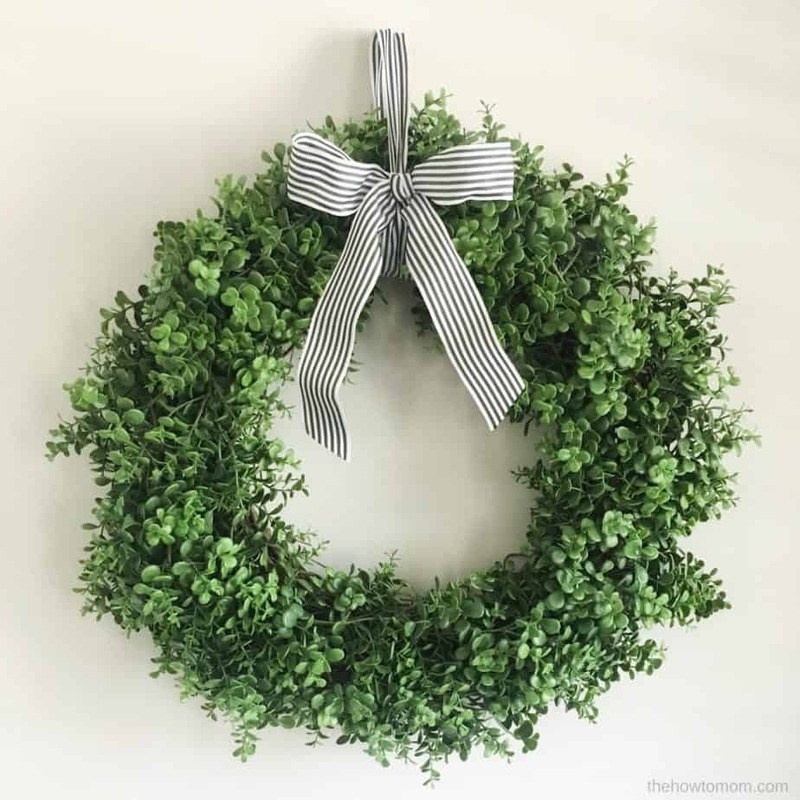 My love of boxwood wreaths goes back a few years, to when my mother in law showed me a gorgeous faux boxwood wreath that she’d been wanting at a boutique in town. It was WAY more than I’d ever dream of spending on a wreath. I took a look at it and decided we could totally make one. And thus the 15 Minute, 15 Dollar Garland Wreath was born. 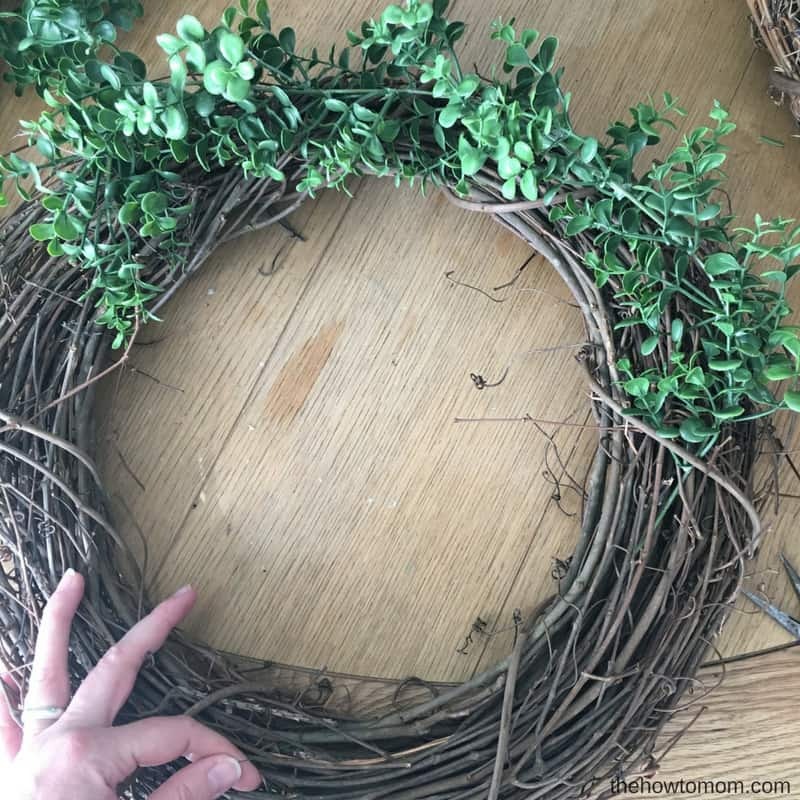 This faux boxwood wreath is incredibly easy. The hardest part is probably finding a good faux boxwood that you like. I found mine at JoAnn Fabric (not available online, boo. ), but I’ve seen decent boxwood at Hobby Lobby and Michaels too. This boxwood garland from Amazon would work too. You could also use preserved real boxwood, and follow the same instructions. 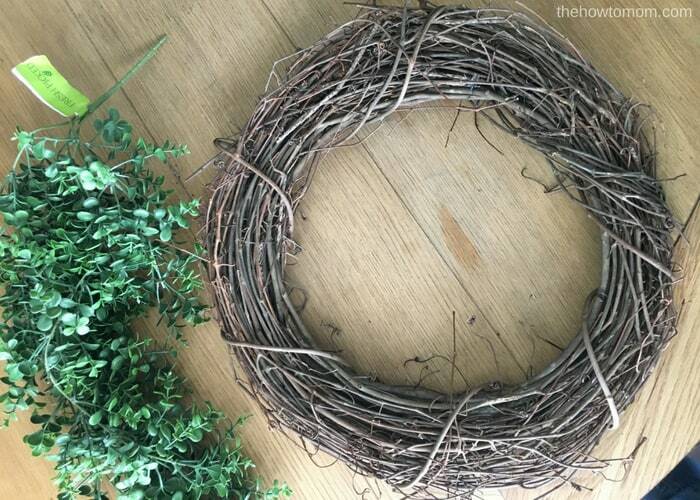 I think you can also collect your own fresh boxwood clippings and dry them to be made into a wreath too. You’ll also need a grapevine wreath. 18in is a nice standard size for a front door, but you could do smaller or bigger if you want. A smaller boxwood wreath looks lovely hung over a large mirror. You’ll also need some floral wire (or twisty ties!) and wire cutters (sometimes I just use my husbands tools). 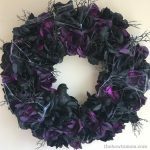 I cover wreath supply basics in my Ultimate Wreath Making Guide, if you want to know more about forms and supplies. These directions are pretty lame, but its because its just so stinkin easy! If using a faux boxwood bunch/bush/waterfall thing like mine, cut the main branches apart at the base with wire cutters. 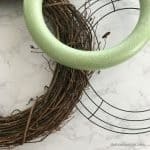 If you’re using a garland, you could probably just follow my Easy Garland Wreath tutorial and you’ll get the same look. 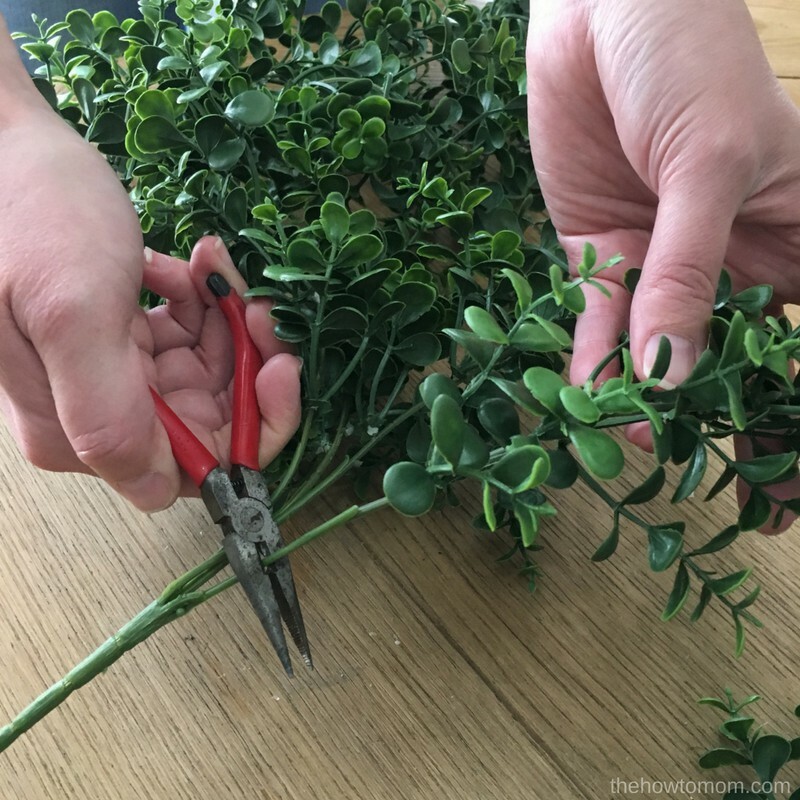 With the floral wire, start laying on the strands of boxwood and wiring them to the grapevine wreath. I started with the biggest pieces and then filled it in with smaller pieces. I tried to build it all going the same direction, but depending on your faux boxwood, it may not be noticeable either way. Keep filling in and wiring on the boxwood strands until you like it. You may need to shake it upside down a bit to make sure everything is wired down securely. For an ultra modern look, you can leave it plain, or I’ve seen cute script sayings like “welcome” that look good wired onto it. Black and white striped ribbon is really popular on boxwood too, and that’s what I decided to go with. I found it at Michaels, but it was clearance and I can’t find it online! Its Aria Modern Pop, if you want to look in your local store. I did find this lovely black and white striped ribbon on Amazon that is really similar. I’d love to see your version, tag me @thehowtomom on IG or use the hashtag #thehowtomomwreaths. 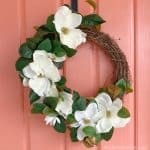 Magnolia Wreath DIY – Farmhouse style and Southern charm! 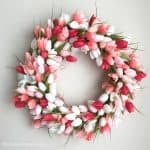 How to Make a Wreath – The Ultimate DIY Wreath Guide!